Since this review, a new version has been released called the High Racer ($219.99). It's an upgraded version of these High Ends, with more protection and reinforced palms. They offer the exact same protection as the men's version. Sizes XS and S aren't available yet, but I've heard a rumor that these sizes will be available sometime before Spring 2017 so stay tuned for updates. I had been lusting over these gloves for a year before making the big jump. I felt like they wouldn't be warm enough for me in San Francisco. I also felt with the ventilation on the fingers and the wrist that these gloves would simply be too cold for me. I've been wearing Racer Multitops for 2 years now and I absolutely love them. They were definitely too warm over 70 degrees, but I figured I could live with that. I rarely ride in warm weather (anything over 80 degrees) so I didn't think anything of it. 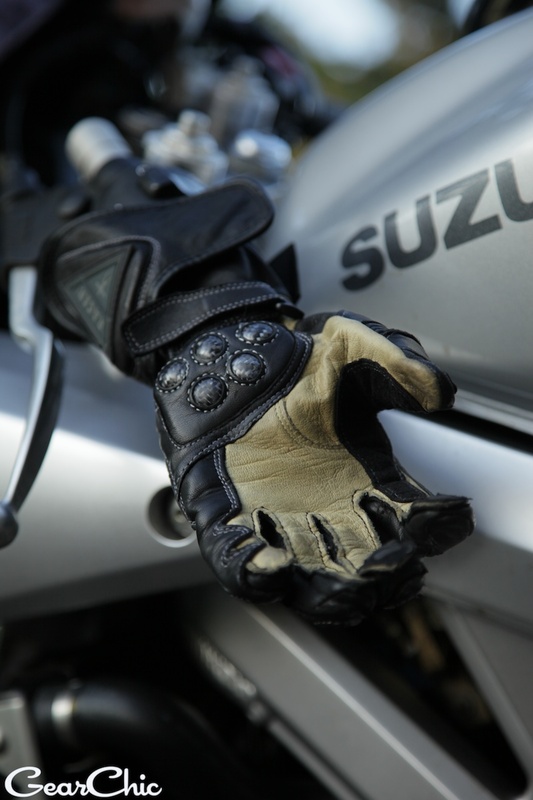 But a recently scheduled trip to SoCal convinced me that I should bite the bullet and get these gloves! I was wrong. So very wrong. If you look closely at, you'll see ventilation in 2 places. First, above the 3rd and fourth fingers and then perforation above the wrists. I thought that for sure this was going to be a deal breaker for me. Well, after riding with these gloves in temperatures down to 60 degrees with windchill, on the freeway, they are deceptively warmer than I thought. I think that my hands don't get nearly as cold as other women. These might be too chilly for some of you but for average weather conditions, these are definitely going to do the job. I now wear these gloves every time I ride. When I took these with me on my SoCal trip in June, they were perfect. The weather in the Bay Area was low 80s and as we rode further down Highway 1 and then 101, the weather fluctuated between 70s, 80s and 90s. I also have Spidi Strada Perforated gloves (discontinued), but never thought to bring them with me. Since we mostly rode along the coast, it never got painfully hot for very long. If you've ever rode Highway 1 in CA, it fluctuates between 60s, 70s, 80s and 90s all within several miles, depending what elevation you're at. By the time you decide to pull over and peel a layer, you'll need to put it back on in a few miles when the fog dips down along the water. I also discovered that taking them on and off with sweaty hands weren't difficult at all. Since the Multitops have a lining, it's very difficult to keep the inner liner inside the right fingers. You have to use the pinching technique to ensure that the inner fingers remain in the right place. Getting them back in is nearly impossible with a slightly sweaty hand, especially if you've been sweating in the gloves to begin with! I found the High Ends to be easy to get on and off even with sweaty hands, with very little effort. As far as breaking in goes, these only took a few short rides to feel super comfortable. Unfortunately the pretty tan kangaroo leather on the palms will quickly turn black after just a week or two of riding. It's impossible to keep the palms looking new. I thought the stitched fingers (from 4th to 5th) would drive me crazy, or worse, get in the way of my braking, but after a minor adjustment of my brake lever from position #5 (furthest) to #1 (closest), I had no further issues. The reinforced stitching along the pinky was really stiff at first, but it's broken in quite nicely and is hardly noticeable. Always remember that when you try on new gloves for the first time, it's going to be stiff, a little uncomfortable and snug. After they break in, they should become super comfortable and well, fit like a glove. Like many women who ride, I have small hands, and short fingers. I do however, have a fairly wide wrist, as I have a hard time getting my hands into a small women's REV'IT glove which are cut narrow around the wrist. These fit me 'like a glove'. I was a little worried that mediums would be too big for me, but when in riding position with my hands wrapped around the handgrips, my fingertips just touch the seams on the inside. There's no pressure inside up against the seams, otherwise they would probably be too small. Remember that riding position is the most important when assessing fit in your gloves too. There's substantial carbon fiber armor along the knuckles, the 3rd-4th-5th fingers, and the palms. I think the reinforced palms are key, since thats most likely going to be the first point of impact if you ever put your hands out in an accident (or even a tip over!). Your first instinct is going to be putting your hands out to catch yourself, and I think the reinforced materials along the outside of each hand is a huge indicator of how well these gloves have been put together. Now, when I fully close my hands into a fist, I can totally feel the armor digging into my knuckles. But, would that really matter while in riding position? Not really. Since my hands are never fully closed, I'm never going to feel that discomfort. You should feel a substantial difference between opening and closing your hands fully vs. wrapping them around the throttle and operating your clutch/front brakes. That difference in fit might make you change your mind about how well these gloves fit. That's why it's SO important to try them out on the bike. I can't emphasize that enough. So many people try on new gloves and immediately close their hands into a fist and then say "Oh these are too tight". But they haven't even stepped anywhere near a motorcycle! Protection: when you go down, whether it's a tipover, knockover, slow speed collision or high speed crash, it is highly likely that you're going to instinctually put your hands out. And then your wrists. Having this added level of protection will keep your wrists from abrasion and direct contact with any pavement. In addition to keeping your arms warm, the gauntlet will keep your sleeves in place so they don't ride up and expose your arms to potential abrasion. As of October 2009, I had the unfortunate experience of crash testing these. I was rear ended while stopped at a red light and was pushed forward and to the right. As a result I fell over to the right side and put my hand out when I landed. I broke my middle finger as it had over-extended itself from the impact. But, the rest of my hand escaped injury, thanks to these gloves! Overall, I love these gloves and would highly recommend them as a high performance street glove for women (and men too!). As of 2016, I have 2 pairs of these because they were discontinued in 2012? :***-( They are still my absolute favorite for riding unless it's colder. Racer is back with a new and improved version, but they've still yet to release sizes XS and S for the US, which is crazy because those are the two *most* common sizes for women!